Here at Leeds Printing Company we offer many different stocks for your brochure & booklet printing. 170gsm Silk stock is the most popular as it is not too lightweight but also allows pages to be turned easily. If your brochure is going to be flicked through very often it might be of benefit to you to consider the most durable booklet printing stock options such as a heavier gsm, a thicker cover or a Matt Laminate cover. Standard delivery anywhere in the UK is FREE for our brochure and booklet printing. We also offer a SAME DAY DELIVERY SERVICE on certain items for a small fee. Delivery time for brochure and booklet printing is 3-4 working days for orders placed by 16.30 with print-ready artwork. Why not order some Flyers or Posters also? Prices shown for full colour stapled brochure & booklet printing on 170gsm Matt stock. Brochures are VAT Exempt. Prices above are for full colour stapled brochures printed on 170gsm Matt. Other options are available for brochure & booklet printing including – number of pages, stock, thicker covers, laminates etc. Standard delivery time is 3-4 working days for orders placed by 16.30 complete with print-ready artwork. Brochures are VAT exempt. 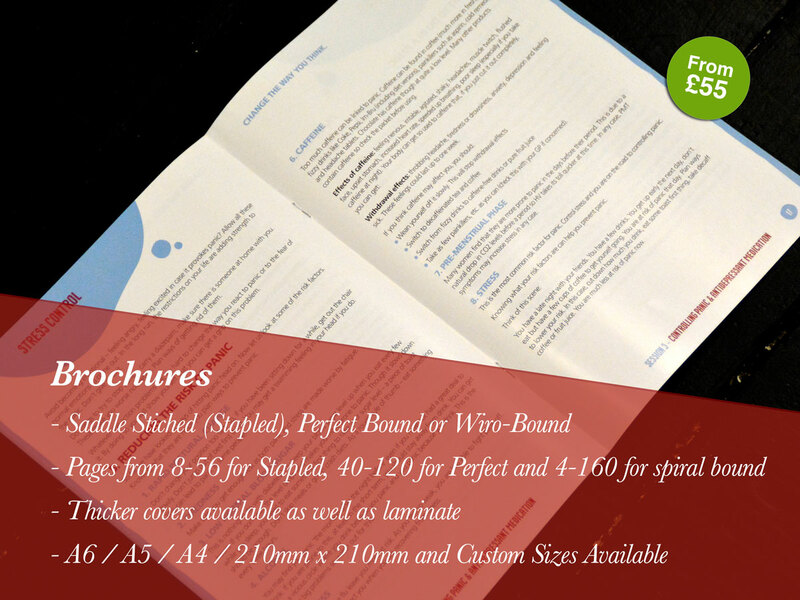 Prices above are for full colour stapled brochures printed on 170gsm Matt. Other options are available on brochure & booklet printing including – number of pages, stock, thicker covers, laminates etc. Standard delivery time is 3-4 working days for orders placed by 16.30 complete with print-ready artwork. Brochures are VAT exempt. What size brochures do you print? As well as our standard A5 and A4, we can also print A6, DL, and 210mm x 210mm. We can also do certain custom sizes, get in touch for a quote. What stocks do you print Brochures on? Can I have a thicker cover, or a laminated cover? Yes, we offer thicker stocks for covers and the ability to apply a gloss or matt laminate to the cover. Get in touch for a custom quote. What other brochure types do you do?